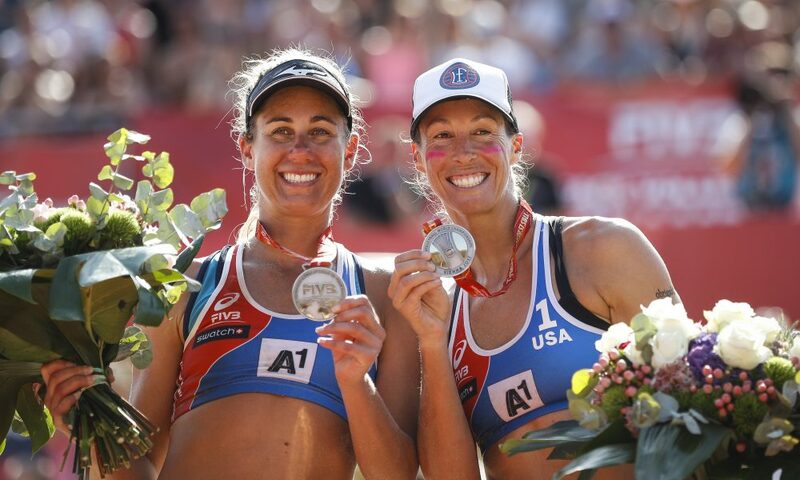 VolleyballUSA: Congrats on the silver medal at the FIVB World Championship. 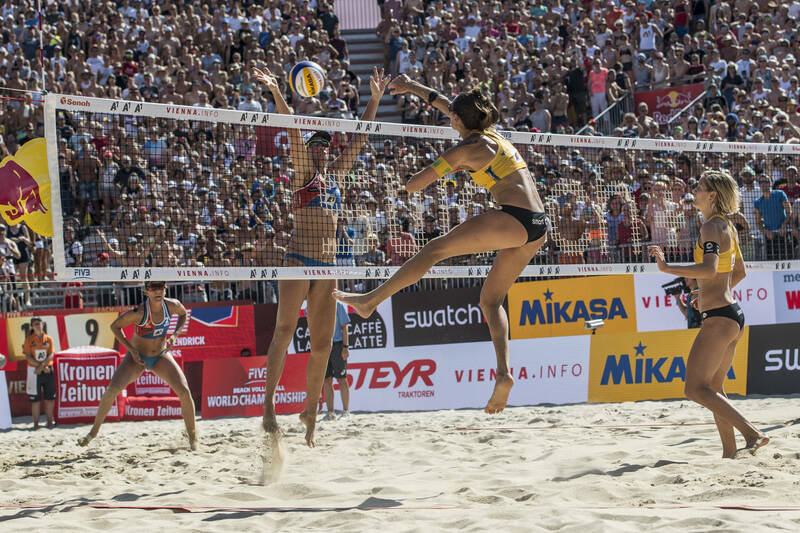 If you’re going to pick a tournament to reach your first FIVB finals, that’s a pretty good one, right? L.F.: It’s been a crazy (but crazy is the standard) year with lots of ups and downs and twists and turns. Having everything line up in the biggest tournament outside of the Olympics was pretty special. The most surreal moment was standing on the podium, and looking to my right, and there’s April, who’s an Olympic bronze and silver medalist and a World Champion, looking to my left and there’s Laura and Kira, the reigning Olympic champions, and Larissa who is a world champion, has an Olympic bronze and over 60 tournament wins and Talita a 3-time Olympian with over 30 tournaments wins. It was so crazy and so humbling to be standing on the podium beside such greats. 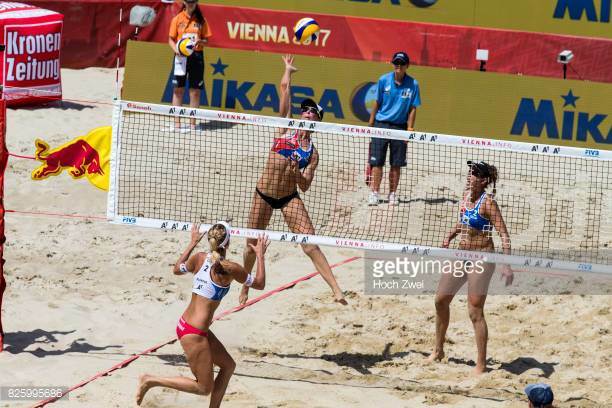 VolleyballUSA: You competed in five sports in high school, including softball, which you played at UCLA along with volleyball. You’ve said that you think young athletes – even those who aspire to eventually play collegiately – should play more than one sport. What were the benefits for you? 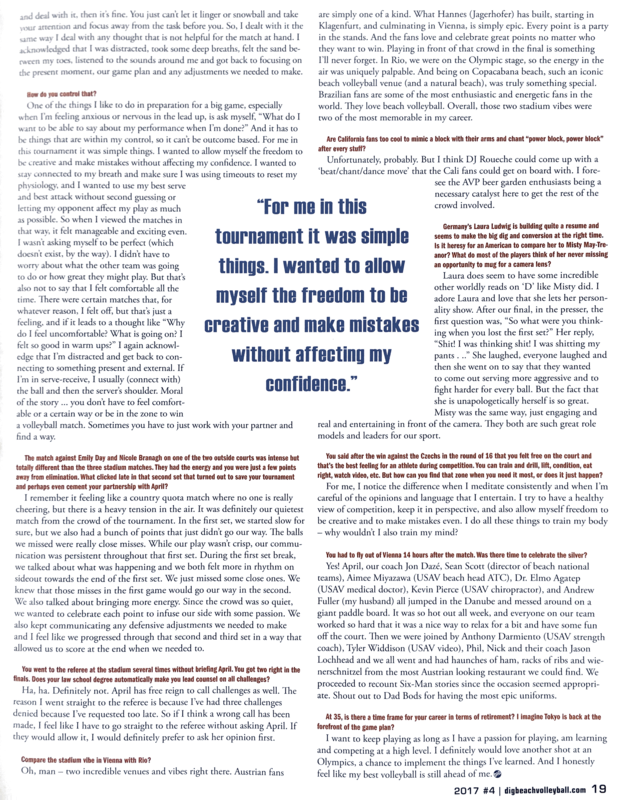 L.F.: Growing up sports were my outlet, my safe place, and my social world, so I was playing multiple sports all the time. I definitely think the variety helped with limiting injuries and mental fatigue, and increasing overall athleticism. The different environments kept everything fresh and fun and helped to limit the amount of repetitive motions that can be hard on the body especially at a young age. I also think having a proficiency at multiple sports allowed for more creativity in movement. Technique is important but I like to now think of sports in a way that one of my coaches, Austin Einhorn, has pointed out. He says (paraphrased) sports are a series of movement problems and the more sports you play, the more movement solutions you have. And playing softball at UCLA was such a treat. I got to experience a totally different collegiate team environment under the great Sue Enquist (head coach) — one that had been producing championships repeatedly! VolleyballUSA: Your current partner, April Ross, says you are very precise in all aspects of volleyball. Give us an example of precision in your game that helps you play better. L.F.: Haha. I don’t think I’m alone in this… I think most successful beach players, especially players who have had success later in their careers, make daily efforts that build over time. This idea that small actions and decisions made on a daily basis can add up to real gains over a long period of time is from a book called “Chop Wood, Carry Water” and it definitely rings true for me. I don’t think I really do anything particularly remarkable in its own right on a daily basis, but having the discipline and habit of doing these unremarkable things repeatedly over the years has helped to get to where I am. I’m pretty diligent about checking in with my body everyday, with my warm up and cool down, with my nutrition on the road and at home. I travel with supplements and foods that I know I do well with (some of which usually require traveling with a cooler). I watch a lot of video of myself and opponents. I usually have specific focuses for each practice and/or drill. I read about performance in my downtime. I pay attention when knowledgeable people around me are speaking (med providers, other players and coaches) and ask questions if I can. A lot of these things can be viewed as hassles, awkward, embarrassing and/or difficult. It can be socially awkward and embarrassing at dinner to ask what doesn’t have egg, gluten or dairy and difficult to still make sure you get the proper fuel for the tournament (and packing backup plans just in case). And each small thing in its own right might only be a small factor in overall performance, but over time, I believe that the accumulation is significant. 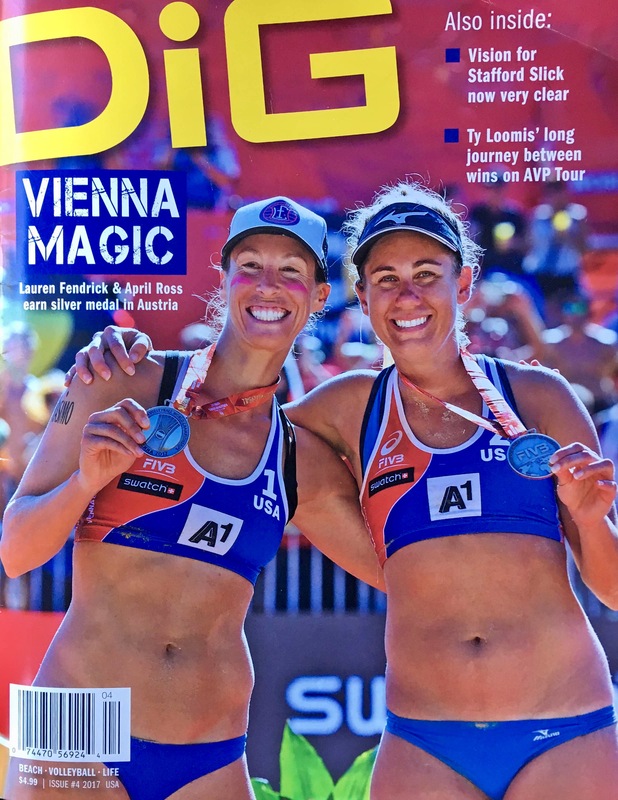 VolleyballUSA: According to April, the two of you have a lot of deep conversations about weighty topics when you’re on the road. What’s one thing you would do to make the world a better place? L.F.: I absolutely love doing deep dives with April. Usually it’s at breakfast on the road after some coffee. She is a really good human who cares about people and the world. I have so much respect for her as an athlete and as a human. One thing that resonates with me is trying to have a big impact on a few people. I loved getting to connect last season with the small number of bright young women on the team at Stanford, people who will have tremendous opportunities to affect the world. 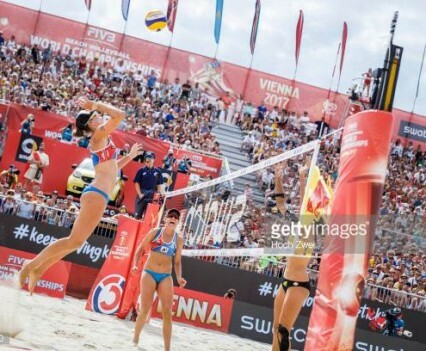 I just want them to know that I care about them on a deeper level than athletics, which I hope empowers them to use sports as a tool for positive change, and to not necessarily see beach volleyball as an end goal. 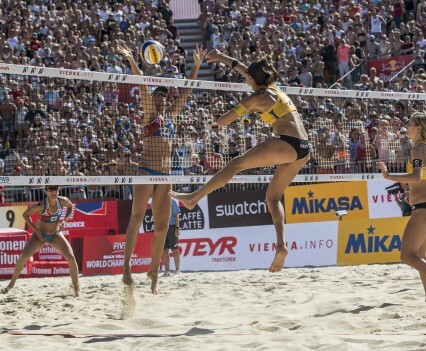 VolleyballUSA: And one thing you would do to make beach volleyball better? L.F.: More money and acknowledgement for coaches. 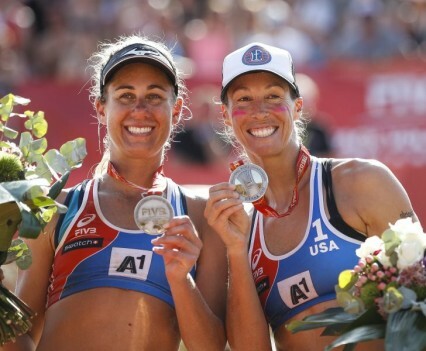 I’ve gotten to work with some extraordinary coaches because of the support of USA Beach Volleyball, but the realities of the cost of living in America make it tough for them to fully commit to coaching professional teams. The college game is awesome in terms of creating sustainable lifestyles for coaches, and I hope that the professional world can either catch up or work hand in hand with that model. Larissa/ talita, agatha/Duda, Laura/Kira all have a minimum of two coaches at every tournament who are working their butts off to help them succeed. Are we going to be able to hire 3 coaches to serve + hit balls at us at every practice like they do in Brazil? Of course not – the economics are completely different, but I do hope we can create enough funding and incentives to get and keep quality coaches. VolleyballUSA: You’re known in the pro ranks as a great blocker. 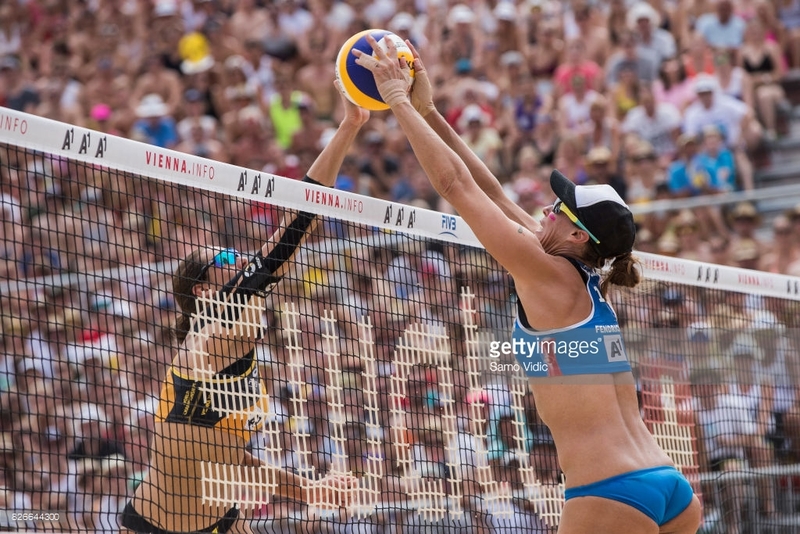 If you’re teaching blocking to developing players, what’s one tip for indoor and one tip for beach? L.F.: Thanks, that’s nice of you! Indoor… I haven’t played on a hard surface since 2007, but I think the advice would be similar. Number one in my book is reading… if you are reading and executing from the read effectively then you will be making your opponent uncomfortable (which is always a good thing). Your read on the play should start with a good line up. And on the beach you might have wind, so make sure you are aware of a set that might blow at the last second and affect your line-up and starting position. Reading is an accumulation of looking at the right things in an attack – speed and direction of approach, attacking tendencies, prior patterns, body position relative to the set, armswing mechanics – and then putting yourself in the way of the attack. 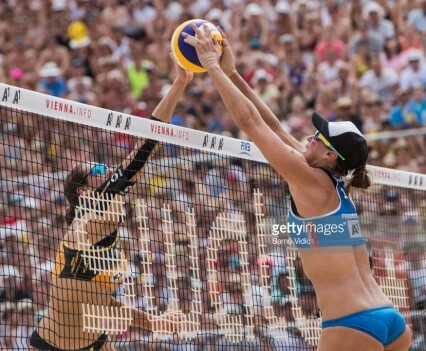 There’s so much emphasis on the size of blockers that we tend to forget that most attackers on the beach only hit the ball a couple of inches above the net – the best readers tend to be the best blockers, regardless of size. VolleyballUSA: You graduated from law school and passed the bar. 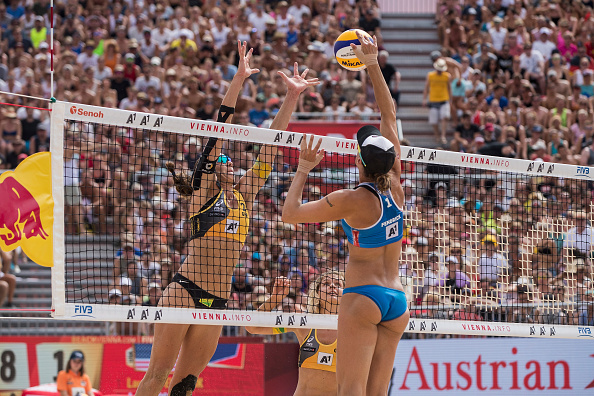 Is there something you learned in your legal training that has helped you in volleyball? L.F.: appreciating that I get paid to do something I love and really trying to soak up all the experiences and opportunities I’m presented with. 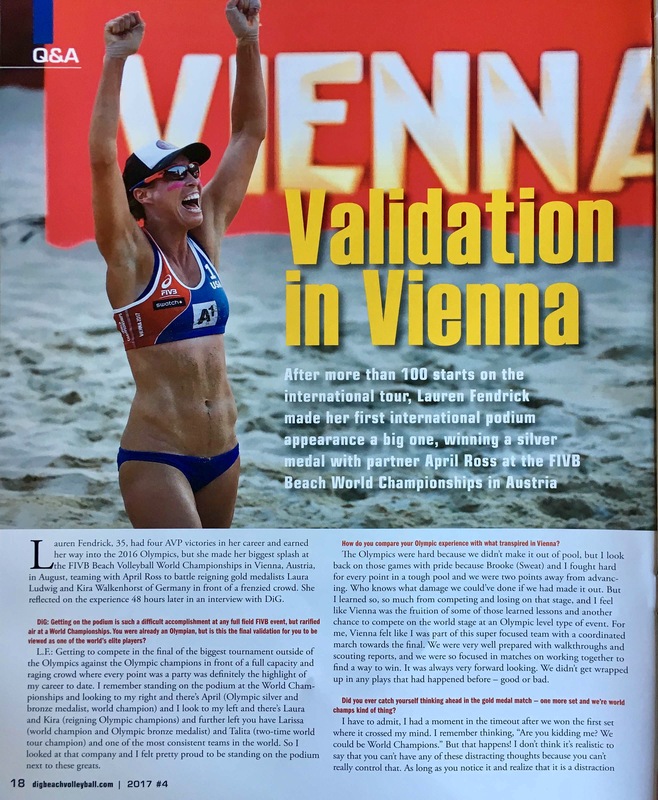 Off the court, there are a lot of complexities with contracts, player issues and national team programming, and I’ve been involved as a World Tour and USA Volleyball player representative for most of my career. 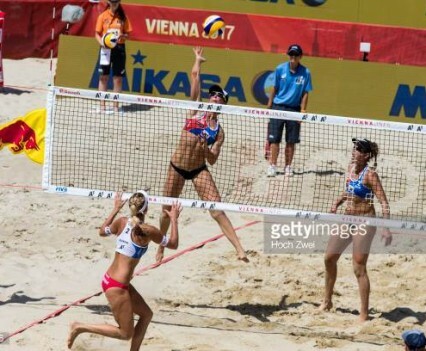 My legal background has absolutely helped the way I approach and try to resolve issues within beach volleyball. VolleyballUSA: You’ve worked through your fair share of injuries in your career. What’s your advice for young players on maintaining good health and recovering when you do get hurt? L.F.: Learn from it. Pay attention to the people around you trying to help get you back to good health (med staff, strength coach, coach, etc.). Ask questions about what they’re having you do and why. Pay attention to your body. Learn what different sensations mean. Is it fatigue, muscle soreness, injury, something else? If rehab excerises (or drills/skills/practice for that matter) get dull, learn to find a nuance in the exercise. Maybe you’ve done the same movement (or skill or drill) 1,000 times before, but there is always more to learn. I’ve passed a bazillion balls in my career, but I’ve recently been paying attention to the sounds surrounding it… The sound of the ball contacting the hitter’s hand, the sound of my partner, the sound of the ball hitting my platform, etc. I’ve also come to realize that I am a complete package – Nutrition, recovery, sleep, warm up, cool downs, stretching, meditating, visualization, stress, thoughts – all of this can impact my performance and how my body reacts. Looking back, in January of last year I tore my right gastroc. I was training the hardest I ever have was in the most conditioned and best shape of my life, but on top of the stress of offseason weights and conditioning I had a lot of daily stress and turmoil and on top of that there was the stress and turmoil of it being the year of the Olympics. I think that the non-physical stress was a part of the reason I got injured. So pay attention to the health of your whole body, mind and relationship circle. 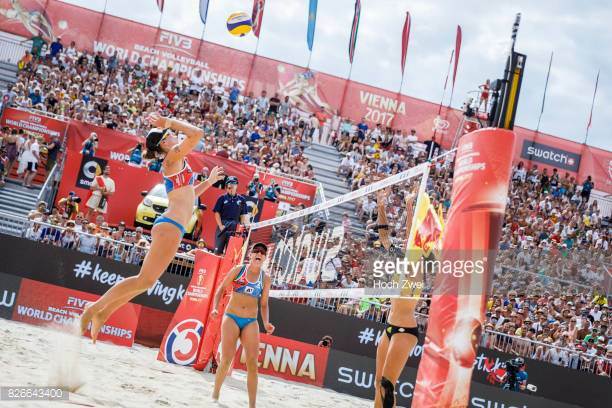 VolleyballUSA: Your husband, Andrew Fuller, is head beach coach at Stanford, and you’re currently his volunteer assistant. You guys must talk a little volley at the dinner table, right? L.F.: I feel like most recently we talk about the athletes, their funny stories, their struggles, their personalities and relationships. We love how much Courtney loves Nickelback, or when Jenna attempted the longest “yeah boi” of all time or when Chelsea showed up to practice in a grape suit (or carrot suit when we visited the stables). They’re really remarkable people that bring so much energy and positivity to our lives on a daily basis. We also talk about the things that I’m going through in my pro career and if/how we can use that to help our girls. 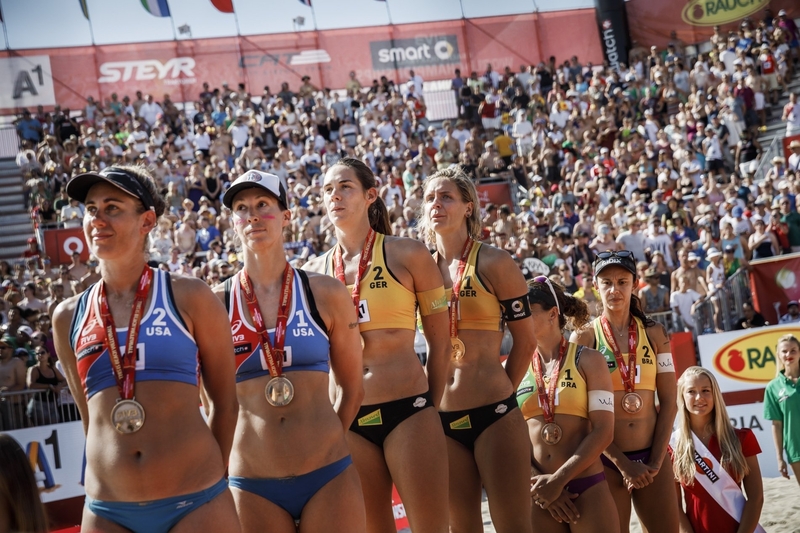 VolleyballUSA: What are the top two things on your “to do” list during the next three years? L.F.: 1) Win all the things! Haha. 2) Keep investing in our small group of humans at Stanford. And possibly figure out what to do after volleyball. It’s so strange that you can develop this career, become expert at it, retire and then you start a whole new career. I will probably always want to keep learning about the human body and exploring the performance benefits around training, breathing, recovery, nutrition, visualization and sports psychology.